How do I filter my transactions by tag? 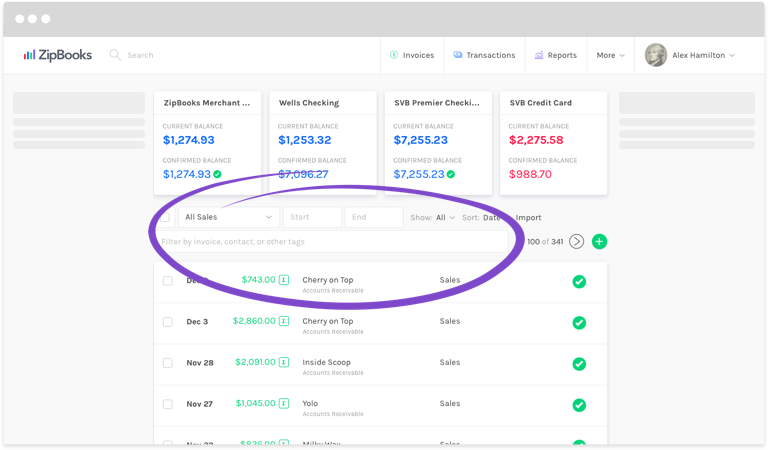 ZipBooks lets you tag transactions in order to have deeper insight into what’s going on in your business. A normal company may have hundreds (even thousands of transactions) in any given month. Easily find what you’re looking for in your ZipBooks account by filtering your transactions by tag. Log in to ZipBooks and click on Transactions at the top of the screen. Above the list of transactions you’ll see a field that says Filter by invoice, contact, or other tags. Put in the name of the tag you’d like to see transactions for. A list of transactions that pertain to that tag will appear in the list. To filter further, use the Category or Date fields above the list. Change the View to Detailed to see more specifics on your report. Your transactions list will show what you specified until you change it. To see the whole list, remove any tags or other filters you added. How do I split a transaction? How do I delete a bank account? How do I export transactions? How do I change a category that ZipBooks auto-categorized? How are credit card and other payments recorded in my account? How do I see a list of all 1099 expenses?